RONNIE O’Sullivan claims his desire to win world title number six burns as strongly as ever after cruising through his first-round match in Sheffield. O’Sullivan held a 7-2 lead over qualifier Craig Steadman following Tuesday’s first session and wasted little time in wrapping up a 10-3 victory yesterday morning. Breaks of 46 and 54 helped him over the line and he will now face two-time runner-up Matthew Stevens in the second round on Saturday evening. ‘The Rocket’ also kept his shoes for the entirety of the session following the previous day’s bizarre incident which saw him play a frame in his socks after his original footwear became too uncomfortable before borrowing a second pair from tournament director Mike Ganley. In his list of career regrets, the 39-year-old claims not breaking in his new footwear ranks pretty highly but will now turn his attention to the rest of the tournament. “It was a bad move wearing the new shoes,” explained O’Sullivan. “When I was buying them I thought they didn’t look right but I’m not a fashion kind of guy. “If any top shoemakers want to get me a nice pair of shoes that’s great. I’ve got this old battered pair that I’ve had for about ten years on at the moment, so I could do with a nice new pair! O’Sullivan will play Stevens after the 37-year-old registered a surprisingly one-sided victory over fellow Welshman and long-time friend Mark Williams. The Carmarthen cueman led 7-2 overnight and registered a 115 break in frame ten to extend that advantage. 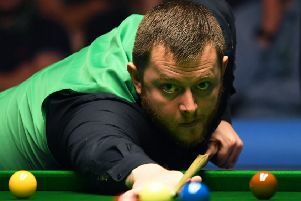 He then quickly racked up the two frames he needed to seal the triumph and although he knows he will be second-favourite against O’Sullivan, the 2000 and 2005 runner-up remains upbeat. “I’ll be a massive underdog against Ronnie which I don’t mind being. I was an underdog against Mark and not expected to win that match,” said Stevens. “It’s never nice playing Mark – we’ve grown up with each other, played junior events together and known each other for about 28 years. But at the end of the day, you have to try and do a job and I did that. “I’ll just come here again against Ronnie, enjoy the game and if I lose, I lose but I’ll give it my best shot. Meanwhile, Joe Perry also sealed a place in round two with a relatively comfortable win over world No 98 Zhang Anda, the lowest-ranked player in the tournament. The Englishman led 8-1 following the morning session and although his Chinese opponent narrowed the deficit to 8-4, Perry then claimed the two frames he needed to see him over the line 10-4. The 40-year-old will almost certainly play Shaun Murphy in round two as the 2005 world champion leads Robin Hull 7-2 after the first session. And Judd Trump held a 4-2 advantage over Stuart Carrington with both of those matches playing to a finish today.